All the statistical data is available as Linked Open Data (LOD), using the Land Book LOD data model. You can reuse the Land Book data in your own website, project, research and more (read more about our licenses). Is the data available? where? how? All our statistical data is accessible as Linked Open Data. A SPARQL endpoint (http://landportal.info/sparql) is provided to query the data. The SPARQL queries that have been used to retrieve the stats data in the country pages are available on gitHub. The first process is to generate RDF from the statistical data that is not available as Linked Open Data in the Land Book LOD Data Model. The statistical data, that comes from a variety of datasets and in a divertisty of formats (excel files, CSV, APIs, JSON, XML...) is passed throught a one of the landbook-importers (available on the github repository). So, after the import process, a list of RDF files are generated and ready to be uploaded to the triple store. 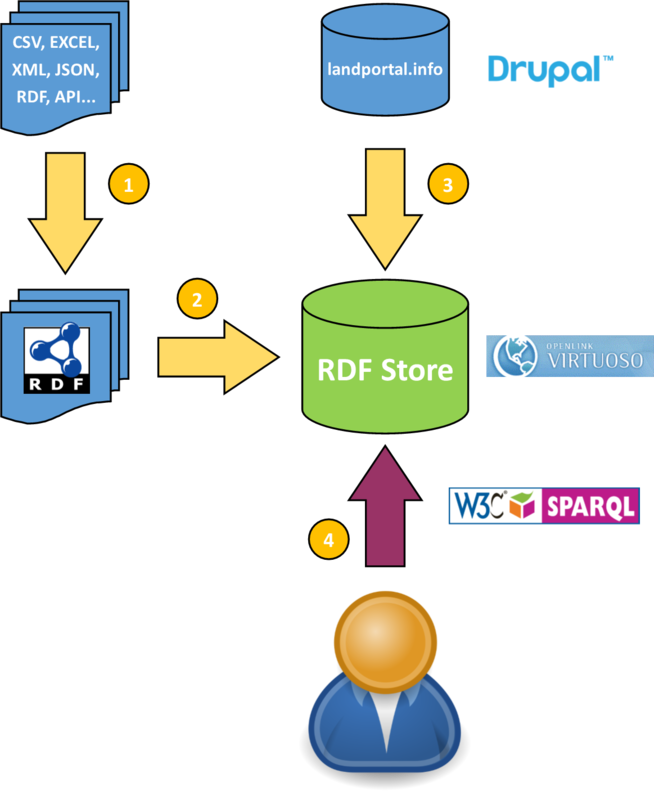 The generated RDF files (that contains the statistical information) are uploaded to Virtuoso, a triple store (also know as RDF store), where the information can be queried using the SPARQL protocol. This process is focused in uploading the data from landportal.info into the Virtuoso triple store in the Land Portal LOD data model. landportal.info (this portal that is running over a Drupal instance) hosts a lot of data saved in a MySQL database. In order to push all this data into the Land Portal Virtuoso a process is runned. This process, using the SPARQL Update protocol, is a combination of a customized fork of the rdfx module (that shapes the RDF generated by Drupal) and a customized fork of the RDF Drupal Indexer module. The latter module uses the Drupal Search API to publish triples to a triple store (in a selected graph). The Land Book LOD Data Model is organized around country-based datasets and indicators, following widely adopted standards for statistical data. Computex (Computing Statistical Indexes) can be seen as an extension of RDF Data Cube vocabulary to handle statistical indexes. SDMX (Statistical Data and Metadata eXchange), an ISO standard for exchanging and sharing statistical data and metadata among organizations. A dataset is a collection of data, published or curated by a single agent (source), and available for access or download in one or more formats (definition from DCAT). Label: Label of the dataset. Description: Description of the dataset. ID: Internal ID of the dataset. Organization: Organization that publish the dataset. Related Overarching categories: Overarching categories related to the dataset. Related Themes: Themes related to the dataset. Related LandVoc Concepts: LandVoc concepts related to the dataset. A statistical indicator is a data element that represents statistical data for a specified time, place, and other characteristics (definition from OECD). Currently, the place is limited to the country level. Label: Label of the indicator. Description: Description of the indicator. Picture: Image to describe the indicator. ID: Internal ID of the indicator. Min: Minimun possible value (integer) of the indicator. Max: Maximun possible value (integer) of the indicator. Measurement unit: Measurement unit, like % or hectares, of the indicator. High / Low: High means it is better to have a high value, low means the best value is the lowest one (like in rankings). Related Overarching categories: Overarching categories related to the indicator. Related Themes: Themes related to the indicator. Related LandVoc Concepts: LandVoc concepts related to the indicator. An Observation represent a single indicator value for a given year and area. Time: The time that is referred by that observation (usually a year or time interval). Use Time Ontology in OWL. Note: An optional comment or note about the observation. All the visualizations you saw on the Land Book pages are using this library. A short video tutorial to introduce our new country pages. Share it, get in touch. Questions? Contact us! Are you are using our data for your project? Share the love with us! If you want, we can even broadcast your audience and share it with people who are intereset in the same land-related issues as you. Don't hesitate to conctact the Land Portal team if you have any question or suggestion.